His dynamic and exciting preaching style is coupled with a practical wisdom and application of the word of God, that will minister directly to your heart in a humorous and down to earth way. Billy Joe Watts is a refreshing vessel of God who ministers in the power and anointing of the Holy Spirit. He and his wife Theresa have hosted the “Hour of Healing” for Richard and Lindsey Roberts and have made several guest appearances on “Make Your Day Count”. They have also hosted and appeared on channel 17, a TBN affiliate station in Tulsa, Oklahoma. Along with all of their ministry experience, Billy Joe is a graduate of RHEMA Bible Training Center, and holds a degree in Public Relations and advertising from Prairie View A&M University. Their ministry will bless you, refresh you, and empower you and your congregation to grow to your full potential in Christ and reach the world with the gospel. 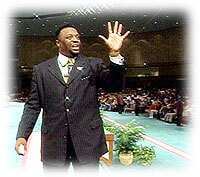 © 2008 Billy Joe Watts Ministries. All Rights Reserved. Website production by Micahtek, Inc.